Huge Demand for Online Analytics Professionals! Progressive Outcome in Digital Marketing is a result of Advanced Analytics and Measurement of factors that affect the reach, delivery and result of online campaigns. This course helps you gain knowledge on how to Analyze and measure your marketing operations. An internship allows you to apply classroom knowledge in real life situations. We help you find relevant work experience opportunities in organizations involved in the Digital Marketing Industry. Our Placement Division helps our students meet companies that practice Digital Marketing. Our Placement Division has positioned students in some of the top companies like Siemens, Dell and American Megatrends. During the course, the students pursue autonomous research on a question or problem of their choice, involve with the academic learning in the related disciplines, and with the supervision of a faculty and industry mentor - produce a significant paper. We connect you with industry leaders who play a major role in the Digital Marketing Industry. Connecting with such people can help you in job hunting, career networking and professional progress. Case studies help you to emphasize detailed contextual examination of a restricted number of events or circumstances and their relations. It helps in obtaining in-depth info about the trends and practices in Digital Marketing. Introduction to key Web Analytics principles and terminology. This course will enable you to build a great career in the Digital Marketing Industry where marketing strategists are in high-demand. The Program is flexible to assimilate and incorporate technology updates into the modules, on the fly. This program also comes with the benefit of Placement support from 361 Degree Minds though you would not have the need since opportunities galore when you do this program. The University of California, Irvine, is a public research university located in Irvine, Orange County, California, United States. 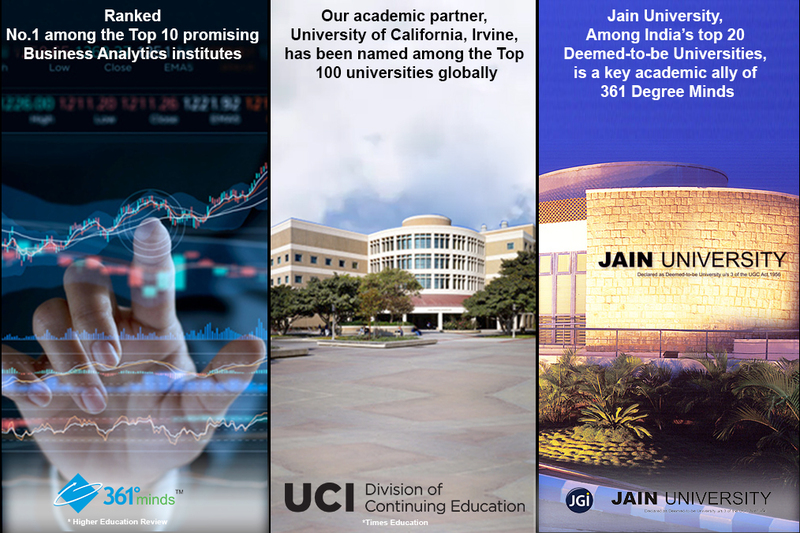 UCI, known for its science & engineering programs, is a top rated university; ranked No.9 among Public universities; and No.1 among Research Universities, and has produced 3 Nobel laureates. CMO & Agency Evangelists, Board Member, Internet Marketing Association, Professor: UCI, OSU, Udacity & Illumeo,MarTech Education Advisor: GreenFig Univ., Industry thought leader & speaker, Background in marketing consulting, marketing automation, & marketing SaaS startups, Leadership MBA & Certificate of Technology Entrepreneurship from University of Washington. Empowers business organizations to understand and properly leverage the social web through education, consulting and speaking. Since 1996, worked with numerous brands: Taco Bell, Washington Mutual, Hilton Hotels, Taylor Made, Toshiba, Hoag Hospital, Kawasaki, BNI, Guess?, Gem Institute of America, and many more. Contributing author: "The Big Book of Social Media Case studies, Stories and Perspectives" and "Boomers into Business"